What is rapid roulette? Its definition varies throughout the world, but in most cases it is essentially a roulette wheel surrounded by numerous betting terminals. There is no physical roulette table, and you place your bets by using a touchscreen terminal in front of you. You cannot usually bet after the wheel is spun, and the best roulette system for rapid roulette is the cross reference roulette system here. 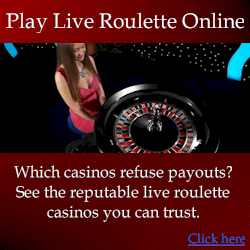 It is the closest thing to a no lose roulette system you will find. In the long-term, you are more likely to profit than the casino is to profit from normal players with losing systems. The main reason the casinos tend to be favoring rapid roulette is because it is an efficient use of floorspace. Strictly speaking, floorspace in the casino is directly correlated to profit. And it most casinos, nothing is a better use of floorspace than a slot machine. But a casino full of slot machines would be boring for many people, so casinos need to provide a variety of games. The procedures and roulette strategies vary depending on where to play, although in most cases you simply sit at one of the chairs and insert your funds. Your account balance will be displayed on the betting screen. Then you can select the bet size by tapping on the unit size selector, and place bets by tapping the virtual bet table. In other words it’s just like playing at an online casino, where everything is done electronically, although the wheel is physically real. Many casinos with rapid roulette have 30 or so chairs all sitting in front of a TV screen, and there is no physical roulette wheel. To a professional player, this is absurd because it is not roulette – it is a gigantic slot machine. The last time I went to a casino and saw this, I would have loved to have gone up to every person sitting in front of the terminal there, shook them around and slapped them telling them you cannot win there. But to be fair, there was a time where even I considered fancy roulette graphics to still be roulette. Looking back though, I have no idea what I was thinking. 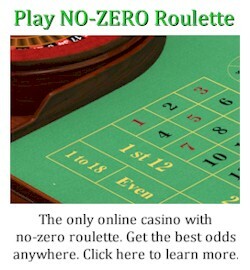 The rules of rapid roulette are exactly the same as any other roulette. Again it is all just an electronic version. But the winning numbers are usually determined by a real physical wheel. At least this is how it begun, although the trend is changing as explained above. I do believe that there is a limit to how far the casinos will go with their implementation of electronic technologies. Put more simply, they will always be using real wheels because many players are smart enough to understand you can’t beat a slot machine, and essentially this is what the big screen rapid roulettes are. If you are looking for a rapid roulette strategy, consider the tips below. 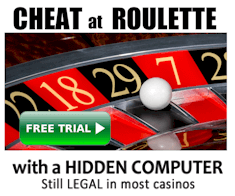 Of course start by learning how to play roulette, and learn the basic roulette bets. 1. If you can’t physically see the wheel, do not trust it. Sometimes rapid roulette does involve a real wheel, although it is not in your physical presence – you see only a supposedly live video feed of it. 2. If there is no physical roulette wheel, it is a slot machine and you cannot possibly beat it. Focus on real wheels only. 3. Get to know the wheel models and features from the manufacturer websites. This is because some of the later models may be real and physical, although they apply are variety of countermeasures that make application of professional methods more difficult. As per my other articles, it does not always eliminate the effectiveness of a roulette system – it is more of a deterrent. Some of these wheels do make winning virtually impossible, although the majority only slightly decrease profitability. But still where you have a choice, choose a wheel that will give you natural organic roulette spins, rather than being manipulated by hidden electronics. And on this note, gambling law almost always states that nothing can be used to influence the spin results. The technology I’ve discussed here does influence spin results, so it is actually illegal. The only reason the governments allow it is because they consider it an enhancement when it comes to unpredictability. Nevertheless, I feel as players are becoming more aware of this technology, they are losing trust in casinos playing by the rules, and this in turn loses them revenue although it would be difficult for them to gauge the losses. There is no 100% safe roulette strategy, but you can get close enough for a system to be a viable income source. For example, the normal edge against players is -2.7% but devices like roulette computers can achieve an edge of over 120%, which is over 40 times greater. So you have a 40 times greater chance of winning than losing in a typical session.